Can somebody help me to understand the value of PISA Assessments as we move to a competency based education system? I tried the sample six levels of questions for PISA. This year's focus was math. You can try them here. I felt that these questions and their problem solving focus required a combination of skills and thinking abilities that are valuable for 15 year olds to be able to do. But I also noticed that Alberta's grade nine math students are doing things like polynomials, binomial products, circle geometry and basic trigonometry. Not one of those six levels of PISA practice questions required any knowledge in these curricular areas. It seemed to me like a strong grade 7 student could have correctly solved the questions on the test. If the grade 8 and 9 course work seems to help students to do well in a PISA type assessment, it appears to do so in an indirect way. 1. If we are moving to a competency based curriculum, with literacy and numeracy skills at the center and a less prescriptive, content-laded syllabus, would a PISA style assessment possibly inform future assessments in Alberta? 2. 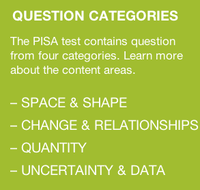 Will curriculum redesign adopt "content areas" similar to PISA, above? Will we move to a problem-solving and competency-based type of assessment that moves away from a lot of the current math "content" that I'm sure many feel are important?